Freetown was successful in that it took me on a journey. When it comes to movie-watching, I am not known for being able to stomach a lot when it come to violence or suspense. I can get pretty hyped up when characters are in danger. 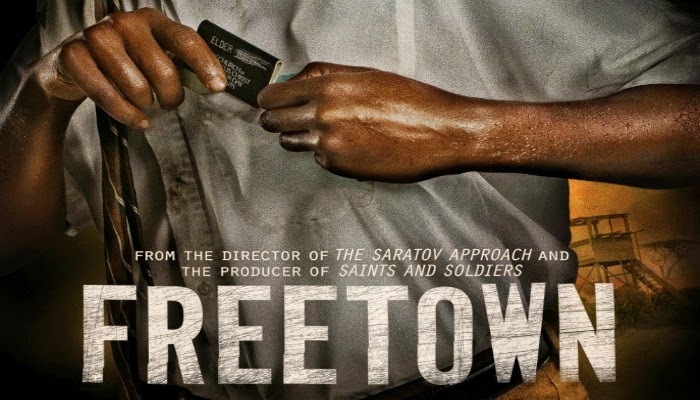 As I started watching Freetown, my insides were all sorts of tangled and edgy. I had a pretty constant sense of "What-Is-Going-to-Happen?" at every turn. "Oh-My-Goodness!" and "Are-They-Going-To-Die?" also stormed my thoughts. But, as the movie progressed, my mind started to settle, which, though I first attributed the feeling to poor pacing, I realized it was how I was supposed to feel. With each act of faith the movie portrays, with each act of courage, with each instance of coincidence, with each mark of divine protection, I realized that the sense of fear and alarm I had felt at the beginning of the movie was dissipating because the makers of the movie had intended to dissipate those gnarly feelings. Sure, there were a few weak moments. In the scene where a missionary and a father are trying to gather food, I was sort of confused by what happened to all of the items they had gathered, and the seemingly random demise of the father. It was confusing. Truth. But the confusion added hype to the moment, I guess. The hellbent, vengeance-filled enemy did not seem as evil as he could have been; the missionary sympathizer only seemed brave when his life was not in ultimate peril. BUT, you absolutely fall in love with the "good guys." The man who drives the elders around. The rebels who do not really have a heart in it, and are only looking for beer. The women at church wearing the cutest dresses I have ever seen in my life. [I want one.] The adorable, smiling, happy, affable Mormon missionaries. And, when you remember and realize that these characters are all real people, portraying a real story, it makes you love them that much more. But, I loved how the movie tackled issues that are oh-so very important. It is good to bring awareness to civil war. It is good to point out that hatred only breeds hatred. It is good to say that you can move past "cognitive dissonance." You cannot change the past, you can only change the future. You can learn to forgive and move on. Stuff like that. Love it. Kudos to the persons who decided to bring this story to light, instead of letting it remain forgotten or unknown to the LDS masses. The overall theme I took from the movie is that, even when a gun is held to your head, you can still feel peace and trust in the Father of us all. Even when you do not know what is coming next, you do not have to worry, because the Lord will provide. And this theme is worth sharing over the cinema. Bravo, Three Coin Productions, bravo. I have walked away from this movie with an honest-to-goodness strengthening of my personal faith. "It just doesn't make sense to doubt anymore." I can repeat those words in recognition of events in my own life, and I hope all that watch this movie can leave the theater and proceed in such faith.